Wisdom comes in many forms . 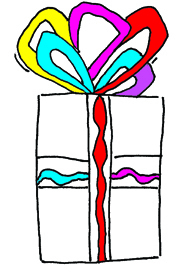 . . often wrapped in surprising packages topped with a bow of hope and love. For you see . . . wisdom is a gift that when you first receive it . . . only seems like any other experience . . . nothing special. However with further observation . . . further reflection . . . the gift of wisdom reveals itself. Wisdom is not a person, place or thing . . . it is the culminating experiences of multiple people, places and things that shine a light of love and peace upon the human experience. It is timeless with many colors and many sounds . . . the true result of all creativity . . . of your creativity. Honor the wisdom embedded in your creativity. Such a nice thought — thanks.